A business today can only be successful if it has efficient workflows and processes in place. If there is a hitch in the system, it will only lead to slowdowns, inefficiencies, and mistakes. This is true in any business, but especially for kitchen and bath dealers. If there’s a hang-up in the purchasing or receiving process, it will hurt the dealership and can ultimately hurt the manufacturer. As a cabinet manufacturer, you may feel as though you’re in control. You make exceptional products and you have a standard ordering procedure that your dealers follow when ordering those products. The process works for you, so why would you need to change it? The problem with that train of thought lies in the disconnect that exists between the dealer and the manufacturer. Dealers and manufacturers each have their own workflows, but the gap between the two can cause major headaches for both parties. A standard ordering procedure may make incoming orders easier to process for the manufacturer, but it can slow down the dealers when every brand they sell has a different ordering procedure. On the flip side, a manufacturer who is lenient with the purchase orders they accept will have to do a lot of work processing the orders when they’re received. Why does it matter? 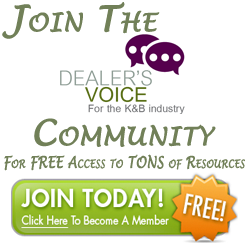 As a manufacturer, as long as my job is easy, why should I worry about the dealers? Because, the better your dealers perform, the better your business will perform as well. By improving the back end of your dealer’s processes you can make them stronger dealers; and don’t you want the strongest dealers selling your products? In other words, a ton of business intelligence before the purchase order. If there was a way to get this data while simplifying the ordering and receiving process for your dealers, you’d be all over it, right? That’s why it pays, as a manufacturer, to know what resources are out there for you. Consider that your dealer ordering system can feed right into your ERP for production. Or, a workflow stop can be implemented in customer care for an acceptance or rejection (with notification to the dealership) of an order. The right ordering system can cut your cost per order drastically. And, streamlined solution means a stronger back end for you, a stronger back end for your dealers and a stronger bottom line for everyone.